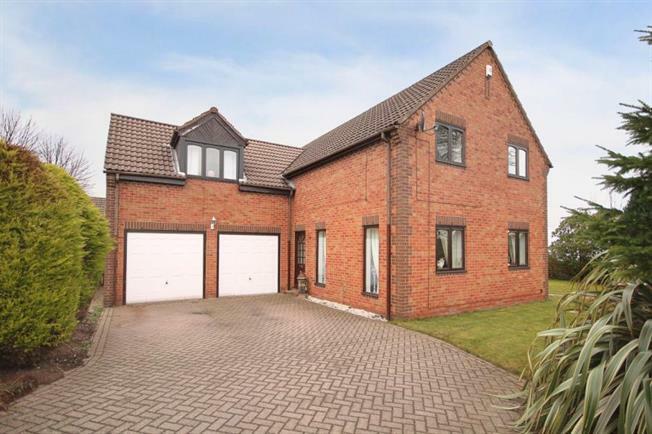 4 Bedroom Detached House For Sale in Sheffield for £375,000. A superb opportunity has arisen to acquire this stunning four bedroomed detached home located in the heart of sought after Grenoside. The property offers two floors of spacious accommodation with the benefit of double glazing, GCH, driveway, double garage, beautiful gardens and conservatory. Grenoside is a suburb approximately 5 miles to the North of Sheffield City Centre. Having excellent local amenities including local shops and pubs, public transport links and road network to the M1. Local schools include Grenoside Primary on Norfolk Hill and St Thomas More RC Primary on Creswick Lane. Grenoside is ideally located for walks and mountain biking in nearby Greno and Wharncliffe Woods. The accommodation comprises a spacious carpeted entrance hallway with return staircase to the first floor with downstairs WC and built in storage cupboards. The lovely lounge has window to the front and side allowing lots of natural light, carpeted with decorative fireplace focal point. The stunning Kitchen and Dining area is fitted with a superb range of base and wall units in a high gloss Vanilla finish with contrasting Granite work surfacing, coming complete with integrated triple oven, hob and extractor, tiled splash backs, Oriole window to the side and window to the rear with aspect over the gardens, having wood effect flooring extending into the dining area with patio doors opening to the conservatory, an excellent space for seating and entertaining with bar. The useful utility room has base units and plumbing for washing machine. On the first floor, the master suite comprises a spacious, carpeted bedroom area with a walk in dressing room with a range of storage, the ensuite has WC, wash basin and recessed shower unit. Double bedroom two is carpeted with window to the front, Double bedroom three is carpeted with window to the rear and bedroom four is carpeted offering flexible accommodation as fourth bedroom, study or nursery. The family bathroom has three piece suite comprising WC, wash basin and bath with tiled splash backs. An early viewing is essential to appreciate the size and standard of accommodation on offer.